I feel that sugar deserves a spot as an honourary member of the Computer Science field, for its integral part in the culture. It’s up there, right next to the coffee. The thing is, our brain is a powerful machine, and according to Popular Science, kicking things into the thinking gear costs 1.5 Calories per minute. That’s not as much as during a physical workout; though trying to sustain active thinking throughout the 8 hour workday will add up to 720 Calories. Keep in mind that 2000 is what is recommended for daily intake. No wonder I find myself snacking on chocolate and loading my coffee with sugar at work — sugar is a form of an easily available energy. 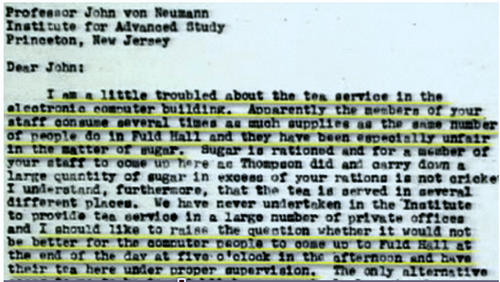 And taking an excerpt from a certain TED Talk — hackers have gotten in trouble for the first time over the consumption of sugar, as seen in a letter below from the director of Princeton to John von Neumann, who was building the first electronic computer at the time. Though while I’m at no risk of obesity as all that sugar is actually burned up, there are other side-effects to watch out for — most notably tooth decay, as I recently found out from my dentist. I am not yet prepared to cut down on sugar, coke, or chocolate; so it’d be interesting to hear what others snack on during the workday. Any special measures to stay healthy? Sugar is incredibly bad for you. It causes obesity, cavities and hypoglycemia/hyperglycemia. Studies have also linked it as a contributing factor toward senility and cancer. It’s also empty calories – there are no nutritional benefits to sugar, so there are no long term benefits to eating sugar. Long term, it also makes you tired, since once the calories are burned up, your body has nothing. Pop is the worst for this, but chocolate bars aren’t much better – they are so processed that the benefits of the chocolate are lost, and the amount of nuts is usually quite small. For a boost of energy, programmers (anyone, really) are better to turn to trail mix, beef jerky or dried fruit like apricots. These all have protein, carbohydrates from fiber instead of sugar, and other nutrients – apricots are a great source of iron and Vitamin A, for example. If you really need sugar, dark chocolate (80% cocoa) has numerous health benefits. Stop consuming sugar and caffeine and exercise regularly and you’ll be able to maintain a much higher on less sleep. Akismet agrees, you write like an encyclopedia author. Though it’s good info: +5 insightful! I’ll try to tweak my snacking… though do you have any opinion on protein (like protein milkshakes)? Once again, in terms of a raw energy snack. I’m not working out in the office. Skip the protein shake. Nuts and meat are all that you need. Eggs are good too. Protein shakes are more for athletes needing to get the extra protein right after a workout. You should check out the book Eat Right For Your Type for diet advice. I know a few people who have tried it, all with positive results, and it’s only $18 on Amazon. I’m going to mostly agree with the above commenter. Our ancestors didn’t consume sugar at anywhere near the scale that most of us do today. The human body wasn’t made to eat candy and drink soda. We crave these things because sugar *is* important, but in small amounts — the amounts that we’d naturally find in crops/nature — not from an endless supply of high-fructose corn syrup beverages. What does science tell us about maintaining optimal mental performance? Keeping the body in optimal health! This means a balanced diet of foods that rate low on the Glycemic Index and daily exercise. Don’t kid yourself. Coffee and sugary snacks are great until you’re obese and suffering from diabetes. You are right, and it’s not just sugar that we are not build for eating in large amounts. Today’s food is made with so much more than what was available a century ago — a lot of what isn’t even naturally available. And I’ll agree with you and Martin both — healthier body and diet is much more beneficial over a power coffee mix. As a side note, I’m not sure if sugar (on its own) causes diabetes; it might just be a contributing factor; though it certainly takes a hit once the diabetes develops. Obesity comes from extra calories in the diet, and the fact that empty/easy sugar calories are burned up first, over more complicated fatty calories from dinner and such. I had to severely cut back caffeine recently. I was surprised to find that it had been masking the effects of low blood sugar. The only way I was able to maintain any energy after quitting was through eating very regularly (every two hours or more often). Try that with some healthier foods and see if the need for coffee and raw sugar tapers off. Peanuts are great to munch on, and provide quick and easy energy. Eat healthier in general, exercise, and you’ll be wanting that caffeine pick me up a lot less, as I can confirm from experience. Look at it this way: we’ve evolved to eat a certain diet. Mostly vegetables, fruits, and grains, with milk as well. Only occassionally(at most once a day), did we get meat. And nowhere in that diet is there refined sugar. Our body has to work a bit harder to get at the natural sugars present in veggies, fruits, and milk products, but the result is much better: you remain healthier, get the energy boost you want, while the breakfast you had gives you the long-term energy you need over the day. Well I’ve recently had to get off coffee and tea which means my main source of sugar and caffeine. The one thing that has been my saving grace for energy is a good dose of Acai Berry juice which is loaded with energy. I also used to be an energy drink fiend..I’d love to see a poll here for programmers and their favorite energy drinks. My vote would be for Bawls g33k b33r! High amounts of sugar is bad and leads to increase in the amount of Blood Sugar. 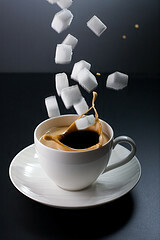 I would recommend that you drink sugar free coffee or artificial sugar that has reduce calories. Personally I find that all “diet flavoured” foods taste pretty horribly. Although that’s a personal opinion; supposedly some people like the artificial taste. A more important point would be the one brought up by Zeroth above. Our bodies are not build for refined sugar. They are much less prepared for artificial sugar-like substances. If we went back to before we had all these artificial preservatives and junk foods i’m sure there would be alot less diseases then we have now. We all sit behind our computers eat junk food and drink enough coffee to fill a pool. We don’t sleep right or get enough exercise. So its up to us to change our diets and our lifestyles. Unfortunately I am have no other variant than snacking something sweet too A little chocolate is very helpful. I think there is no anything energy then something containing carbohydrates. I eat dried fruit whilst im working, it still has a lot of natural sugar in it but is much healthier for you. The problem with coffee is is always goes cold when im busy! .Cook 2 eggs your style (scrambled/fried/boiled). .Make a butter/margarine and jam/jelly sandwich. .Consume them with a glass of warm chocolate (Milo/Ovaltine) Milk. That should take care of your sugar fits. If you still crave more sugar later in the day, try eating a banana or an apple. If no fruits avaiable, Tim Horton’s Chocolate Dip Donut doesn’t have that much sugar. Have you ever tried fructose instead of sugar? Although nutritional experts are not too enthusiastic about it, (seems that the liver can’t process it all fast enough for the body to use as sugar and thus it reacts by sending off triglycerides into the bloodstream) if taken a bit at a time, it may help your body process glucose more properly. By the way, the book that Martin mentioned “Eat Right For Your Type” is indeed a great read.